[an error occurred while processing this directive] visits since May 22, 2005 I reserve all rights © to the digital copies for Dale Clarke, or those who provided those images and the photo album presentation design for Dale C. Clarke. They are for the education and enjoyment of users of GoZonian.org. There has been a display of American Flags down Lamplight and Centurion Lane. 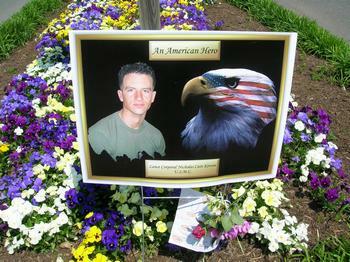 It is for a real American hero who died for us in Afghanistan on Mothers' Day, 2005. The note and flowers are from one of the classes at Navy Elementry school. 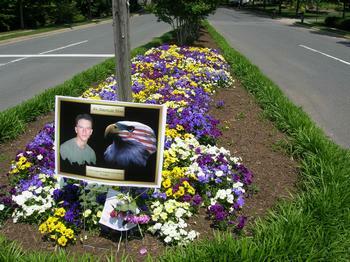 This display is in honor of Nicholas Kirven, a 21 year old Marine Lance Corporal, who lost his life in Afghanistan Sunday, May 8th, 2005. Nicholas was the son of Beth Belle, a resident of Century Oak, Fairfax, Virginia.